It's been a while since I read a book that I literally couldn't get enough of. I was picking this up every spare moment I got because I needed to know what was going to happen next. I won't bore you with the basics of the plot because I'm pretty sure almost everyone knows the general idea of the story by now. But wow. This book legitimacy scared me. The author does a fantastic job of building tension and giving description. The monsters that live in the maze, the Grievers, are unlike anything I've encountered in another book or movie, but I had such a clear picture of them and...I wouldn't wanna be caught near one. Plus, the world as a whole was terrifying. Trapped in the middle of a big giant maze crawling with monsters, no idea if you'll get the supplies necessary for survival each week, and then when things start changing for the worse....noooo thank you. This world scares me more than The Hunger Games world. At least if I was a tribute I'd die a pretty quick death, no doubt about it. Here, I'm stuck, no clue what's going to happen next, if I'll ever get out, wondering why I'm even there. It's constant fear and worry, which I think the author captures very well. My favorite thing about the whole book is actually what made a lot of people hate the book -- the fact that you know no more than Thomas does from the very beginning. There's no world building before you meet Thomas and enter the Glade. You're right alongside him from the start, just as confused about the maze, the whole Glade in general, the people, and the slang terms used. I've heard so many people say so many pages were wasted with Thomas asking questions and not getting answers. But I loved that! It's what made the book unputdownable. I knew he'd get answers eventually, so I kept reading until I figured out what the heck was going on. I'll admit some of the characters were a little flat and some of the plot twists were a little predictable, but that didn't take anything away from the book, in my opinion. This was such a fun and exciting read. 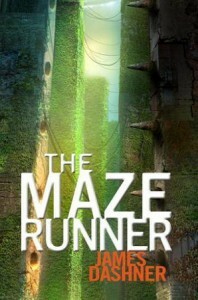 I'm going to start reading The Scorch Trials right now. Literally, right now.